It’s Episode 3 of the sports comedy podcast Sport Man Toe, and today Spike and Shane are discussing Tom Brady’s new mansion, the delicate topic of gator control in America, whether or not Germans like American football, Mario Balotelli departing for AC Milan, British soccer fans being British soccer fans (by which we mean vulgar scoundrels who pee on camouflage cars), the Catholic Harbagh brothers and what would happen if the Harbaugh son is gay, our own memories of playing sports and the emotional breakdowns and cowardly moments we endured, the dangers of evaluating females in rubric format, whether a clone basketball team of Spikes and Shanes could outscore Northern Illinois, defeating Usain Bolt in a sprint, and a study showing that southern men get more pissed off than northerners if you shoulder-bump them in a hallway. As with last time, we finish with a J.J. Redick poem that MAY indicate a history of serial murders. The SEC has become the Mighty Morphin Power Rangers. Every kid from the 90’s remembers the Power Rangers – the average (and oh so perfectly diverse) group of high schoolers who were given super powers to protect the world from alien monsters. Either you were still young enough to openly enjoy the weird Godzilla-esqe fight scenes or you sneakily watched them because you thought the Pink Ranger was cute. Wether you admit it or not, you watched the Power Rangers. As you well remember, in every episode the Rangers would be getting beat down by the random monster of the week. The monster would grow to giant size. 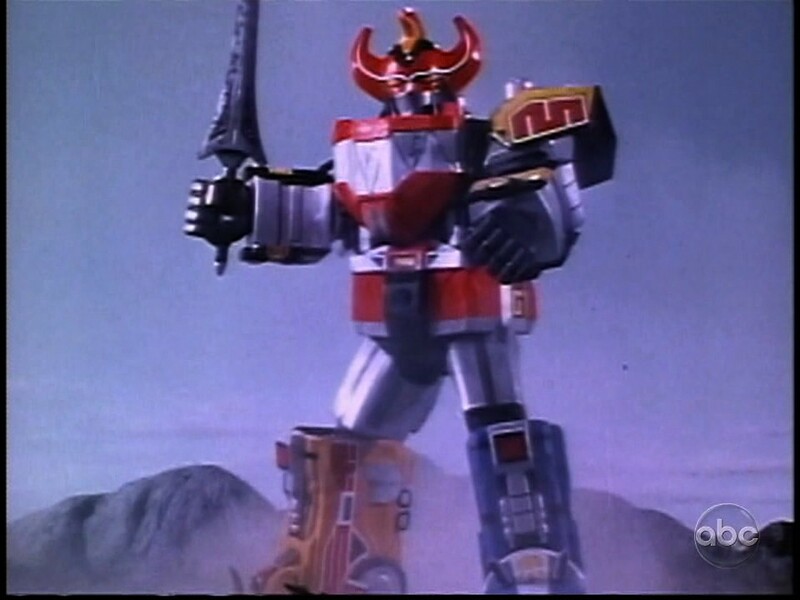 The Power Rangers would call out their Voltron rip-off “zords” that would join together to become the Megazord and win the battle. Just a quick announcement that I, Shane Ryan, will no longer be doing the Walk-Ons due to the fact that I had too many irons in the fire and need some time back. I realize that this just barely merits an announcement, but I thought it was fair to let you all know in something more than 140 characters. Doing the show was awesome, and I’m grateful to Matt and Ben for jamming with me, and to all y’all for listening. Whether the show continues or not will be up to them, and I imagine they will let you know soon. Thanks again, and sorry for the abrupt announcement. I will take this moment to note that I’ll still be doing the once-weekly SportManToe podcast, a sports-comedy joint, which you can find on this site or at this tumblr. Sport Man Toe Episode 1! It’s the first ever episode of the sports comedy podcast Sport Man Toe, featuring Shane and Spike, and today we’re talking about mayoral sports bets, celebrity divorces, how Tiger treats a rivalry, stabby rascals, coaching mediocrity, lacrosse stereotypes, fat soccer players, Shane Battier’s post-NBA karaoke career, and frivolous lawsuits against Gregg Popovich. It’s a rollicking maiden voyage, so check us out. Today we’re talking about Duke’s loss to those earthy cads at N.C. State, Michigan putting up an offensive stinker at Ohio State, and Indiana unleashing 20 minutes of beautiful basketball to beat Minnesota. All that, plus we talk about the best commercials on tv, tackle some reader emails, and explore the question of how far you would go to get good seats at a sporting event. Would you entertain a stalker? Would you put on an orange vest and pretend to take photos? Then we tucker ourselves out debating when it’s okay to charge the court. Does there have to be a game being played? Can it be a court of law? Matt and I then reveal our man crushes on Izzo, and we talk about whether Coach K can get vindictive after games. Last, we bolster Ben’s self-esteem by pointing out that many listeners don’t even know his name. All in all, there’s a good amount of dysfunction here, but that’s how we roll. The Walk-Ons podcast is basically three guys talking about basketball via comparisons to The Bachelor, lazy reductions to crude personal biases, and stories about midgets. Interestingly, all of that varied discussion is book-ended by an indie song. Given that combination, and my own love of both basketball and the sort of indie music that makes me appealing to girls with black rimmed glasses and/or tattoos, I figured Tobacco Road Blues was the perfect place to run down the top NCAA title contenders by comparing each team to an indie band (in no particular order). So turn down the volume on that one publicly funded indie music station in your area (WNCW! ), give this a read and let me know how my crap musical taste and uninformed basketball analysis make me a Chuck Klosterman wannabe (that’s what the internet is for, after all). Kentucky = Polica – You might think the Minneapolis-based Polica would equate to hometown University of Minnesota. However, this group of musicians assembled from previously successful local and national bands has a perfect UK freshmen recruiting class feel. Polica’s signature sound is incorporating two drummers, which is the basketball version of stacking up on big post players the way Kentucky does. One of those drummers is Mike Noyce from the nationally hailed band Bon Iver. The lead singer is Channy Leaneagh, a songstress from a local Minneapolis band that broke up. Her local legend and Noyce’s folk hero status make Polica one of the bands to watch going forward. But they’ve only put out one CD, so it’s hard to know if all the disparate pieces will continue to mesh together. If they do, as with Kentucky, they’ll put the rest of the country on notice. UCLA = Joe Purdy – He may not be as nationally known as UCLA and their star studded roster, but Joe Purdy is one of the most prolific singer/songwriters in the country. Purdy has put out 12 albums in 8 years. And though he gives off the air of a downtrodden troubadour, his songs have been featured on commercials and in television shows. In fact, Grey’s Anatomy used not one, but three of his songs. UCLA, like Purdy, is a team that has promise, is prolific and might pop up on the national stage even if right now they exist outside the musical mainstream. Missouri = Destroyer – If you listen to The Walk-Ons podcast, then you know that Frank Haith blows. The question is, what does Frank Haith blow? Well the answer might be a saxophone, which is why Destroyer is the indie music equivalent of Missouri. Also, with a band name like Destroyer you’re disappointed when you listen to them and realize it’s dulcet electronic pop. It’s the same kind of disappointment when you see Missouri run up and down the court all game only to pour water on all that excitement by choking down the stretch. Gonzaga = Okkervil River – Even for indie music fans, Okkervil River is one of the deep tracks. A band from Austin playing old school folk is never going to make it with the masses. Their old-timey music and appreciation by only the most hipster of hipsters makes them the Gonzaga of music. They might be lauded in particularly crunchy coffee houses, but, as with Gonzaga, they’re not a threat nationally. Minnesota = Old Crow Medicine Show – As with the Gophers, people have been waiting for OCMS to break through nationally for years. In fact, I saw OCMS open for Robert Earl Keen back in the early 2000s. Back then the band members were kids who couldn’t legally drink at the bar, but there was certainly a great deal of musical promise and about a decade later they are delivering. Likewise, Tubby Smith arrived in Minnesota in 2007 and is only now sticking his head above the Mendoza line of mediocrity. Ohio State = The Black Keys – The Buckeyes are little atypical given that they basically a bunch of small and power forwards. What Ohio State does well, though, is play gritty and hard-nosed basketball. It’s a brand of basketball that fits the narrative of a blue collar rust belt state like Ohio. The Black Keys hail from Akron, Ohio and their style of blues and indie rock is the kind of distorted guitar soundtrack Thad Matta’s squad personifies. Furthermore, The Black Keys were at their best in the older and rawer, less produced albums. Like The Black Keys, the Buckeyes are at their best when the game avoids style and flash in favor of getting a little ugly. Florida = Tom Petty and the Heartbreakers – Okay, so Tom Petty isn’t an indie band exactly. Still, Tom Petty is the best fit for Florida (and not just because he’s from Gainesville). Most people enjoy the musical catalogue of Tom Petty, but most people would recoil at the idea of Tom Petty as one of the best classic rock acts ever. That’s pretty much Florida in a nutshell. The Gators are good, but you’d hesitate to put forth a full throated case for their title chances. Both are good and maybe under-appreciated, but their case for greatness is somewhat flimsy despite all their merits. Syracuse = Yeasayer – People will tell you about Yeasayer. They’ll insist that they’re good and if you say, “yeah, they’re alright I guess” you’re seen to be a “hater” or otherwise musically unrefined. Yeasayer are from Brooklyn and toured with MGMT and Beck so, like Jim Boeheim and Syracuse, they’ve got all the required pedigree and bona fides. Still, there’s something less than impressive about both Syracuse and Yeasayer. There’s nothing wrong with either, per se, but you’d be hard pressed to argue that Syracuse or Yeasayer are the best of their respective bunches. Arizona = Lana Del Ray – In order to get in on the burgeoning mass popularity of indie music a record company found a girl, gave her puffy Angelina Jolie lips, fashionably unfashionable clothes and had her sing a sultry song. Some people really liked her songs, other’s thought she was completely inauthentic. Then everyone bailed out on her when they realized she couldn’t sing live because she wasn’t all that talented. The career arc of Lana Del Ray foreshadows Arizona’s season perfectly. Right now they look hot and ready to set the world on fire, but the Wildcats are a team built on a foundation of lies. They simply aren’t that good. They trailed Clemson for much of that game and should have lost to Colorado were it not for a blown call. That was Arizona’s Lana Del Ray singing on SNL moment. In the end, Arizona will be shown to be a phony just like Lana Del Ray. Kansas = Gotye – The first time I heard that song I thought, ‘Hey, that’s not a bad song; pretty catchy actually” (note that my thought process uses semi-colons). Three months later I wanted to stab that guy in his body painted face because the radio, from indie stations to the pop ones, wouldn’t stop playing it. That’s going to be Kansas. They’re not bad at first glance, but they’re bound to get overhyped as they walk over the weak competition of the Big 12. In the end, you’ll be as relieved when Kansas gets knocked out of the tournament as you were when they stopped playing “Somebody I Used to Know”. Indiana = Fun. – The band Fun. is basically Gotye with more staying power. It’s indie pop with mass appeal. Fun. got their song, “We Are Young” all over the airwaves and television to the point that the Glee version of it was way up on the iTune charts. In the end, though, there’s the underlying feeling that both Fun. and Indiana are products of a popularity contest rather than valuable commodities based on their substantive worth. Indiana is favored by the masses, but you can question if they’re in it for the long haul just as you can question whether or not anyone will remember Fun. two years from now. Louisville = Band of Horses – There are a lot of good things to say about Louisville just like there are a lot of positive things to say about Band of Horses. Both are popular picks and in both cases you can see why. But if you care to poke holes in the team or the band, which neither of their blindly loyal and rabid fan bases care to do, there are some cracks in the façade. Band of Horse has one really, really good song (“The Funeral”), but after that there is a bit of a fall off in terms of the quality of their musical repertoire. Similarly, Louisville has Peyton Silva, who can be counted on for quality, but Russ Smith is kind of all over the place. As with every Band of Horses song not called “The Funeral”, Russ Smith is very hit or miss. Michigan = Jack White – If there is a universally appreciated figure in indie rock, it’s probably Jack White. No one doubts his musical talent or the fact that he can expertly play a variety of different kinds of music. Michigan might be just as elite in basketball as Jack White is in indie music. Michigan can handle different styles of play and has extremely sound fundamentals. You can take the analogy further when you think that Jack White is a solo artist now, but was formerly part of The White Stripes, a two person band that included his sister Meg White. In that scenario, Trey Burke is Jack and Tim Hardaway Jr is Meg, which I find hysterically funny on a number of levels. All told, Michigan are going to be a staple in the basketball season the same way that Jack White and his White Stripes background are a constant influence on indie music. Duke = The Avett Brothers – Whether you call it alt-country or indie-folk or neo-hippie, the Avett Brothers are the gold standard. The band with North Carolina roots represents Duke nicely because both are extremely successful and both elicit a quick response from people who either love or hate them. The thing with the Avett Brothers is that they’re playing music that is a throwback to the folk and bluegrass of yesteryear. Naysayers argue that they’re just trying to mimic music from the past but doing so with less talent than their predecessors, which almost exactly what Duke is doing. Talent-wise, the Blue Devils don’t measure up with past incarnations of the team. Still, running the same system as those previous Duke rosters and doing so as a group of guys with great team chemistry has what might be a less talented Duke team set up to achieve the same heights. Both Duke and the Avett Brothers are throwbacks, but both are finding success with their outdated ideology in an ever-changing musical and basketball landscape. Today the los tres locos are talking about a crazy Wednesday in college basketball, where Kansas survived another scare, Minnesota beat up on Illinois, and New Mexico won a big MWC clash (Shane had to force them to even mention this). Then the convo turns to Ryan Kelly’s foot scare, and which of the three remaining undefeated teams might lose this week; Michigan at OSU, Duke at N.C. State, or Arizona at Oregon State. Then the talk gets emotional, philosophical, psychological, and soulful. For real. Plus more relationship stories. This episode features listener voicemails and in-depth analysis of Duke’s Jabari Parker signing. We’re walking a little bit on the wild side this Tuesday afternoon, with talk about arsenic-laced birthday cake, twitter fiascos, everything the media won’t tell you about Miss Alabama, and even a little bit of basketball. Matt won’t stop referencing “The Bachelor,” his favorite show, while Ben thinks UNC is a fraud and Shane got his twitter name on an ESPN broadcast under false pretenses. Are Duke and Michigan elite teams in comparison to the rest of college basketall? Was this past week in basketball exciting or dull? Can UCLA win the Pac-12? Are Kentucky and Florida the two most underrated teams at the moment? What will the three-man brain trust say about the surprising ascent of Kansas State? All this and more, including the exciting race between Matt and Jay Bilas for basketball commissioner.